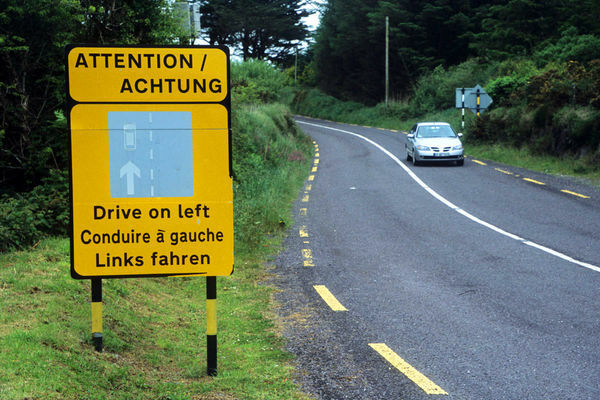 Georgia may have a distracted driving law, but in Ireland, I’m more worried about confused driving. This week I was a tour guide for friends travelling in Ireland. I’ve been there twice before so I know the attractions, plus I can drive wrong pretty easily. After all, who can’t drive on the wrong side of the road? The Irish have been driving on the wrong side of the road ever since the English began their tyranny over the Irish, an oppression that has lasting affect to this day. We still hate the English and probably always will. “We” being the true Irish, not those 33 million of you Americans who have Irish heritage but don’t pay attention to the homeland. Now with a name like Kelly Burke, I have a head start on many of you in claiming Irish roots, but just in case reparations from the hated English ever occurs, I’m asserting my demand now that I want my castle back, fully restored. Back to driving, the English, worried that someone might stroke a sword across their neck in retaliation for the heinous English atrocities committed against good and peaceful people, drove on the right side. This being the predominant side, enabled the driver easier access to a sword for defense. Americans, relying on firepower instead of swords, drove on the right side where they could see their wagon wheels had clearance from passing wagons and yet have the right arm free to lash the horses. Today the English still drive on the wrong side of the road, probably to defend themselves from their 500 year history of oppression of freedom loving people. We rented a car, and of course, a reservation meant nothing. They didn’t have my requested car, instead they had a SUV (really, a minivan, but that sounds like a mom-mobile, so I’m going with crossover SUV). Yes, one drives on the left side of road. Yes, the steering wheel is on the right side of the car. Yes, it was a manual transmission. Yes, the shifter is on the left, as is the rear view mirror. So I had to reverse everything I know in order to get out of the parking lot. The good news is that there is plenty of traffic leaving the airport, so you just follow the car in front of you until he gets home, and by then, you’ve got the hang of it. Hopefully he doesn’t live too far from where you are headed. I only caught myself driving on the wrong side of the road one time and since the road was the size of my driveway, my error went undetected. Irish roads are notoriously narrow, hilly, sharply curved and potholed. I will say that in the ten years since my first visit, roads have improved a great bit. Their M “motorway” roads (414 miles), similar to our interstates, are better than ours. Their N “national” roads (1667 miles) can be nice, like Highway 96 in Houston County, or they can be about 10 feet wide. Someone has to pull over, but they will. The Irish are incredibly, wonderfully, magnificently nice, patient people. They are by far the most pleasant drivers I have ever encountered. They are seldom in a hurry, they let people cross all the time and they seldom honk. I got honked at once when I couldn’t make up my mind, so I went right, then left, then right again. I think the last move was what got me the toot. Their predominant road is a R “regional” road (7207 miles), similar to any farm road in Georgia, just paved or gravel. They don’t have dirt roads. Ever. Every inch of Ireland is green or rocks. Speaking of inches, The Republic of Ireland is bigger than West Virginia but smaller than South Carolina. Squeezing 4.75 million people onto roads that often classify as improbably passable, and notoriously known for drinking alcohol, you’d think my Gaelic friends would have a high traffic death rate, yet for every billion miles travelled they average 3.9 fatalities versus 7.1 in the U.S. Last year, 158 people died on Irish roads, versus 1549 on Georgia’s roads. Police? Never saw one policing the roads. My analysis of data shows that the states with higher percentages of Irish residents have lower traffic death rates, sometimes far lower. Georgia’s high death rate of 15.8 deaths (one of the worst, actually) per million miles is directly correlated to a lower percentage of Irish descendants (only 7.8% of population is Irish). Want lower traffic fatalities? Get more Irish! Kelly Burke, master attorney, former district attorney and magistrate judge, is engaged in private practice. He writes about the law, rock’n’roll and politics or anything that strikes him. These articles are not designed to give legal advice, but are designed to inform the public about how the law affects their daily lives. Contact Kelly at kelly@burkelasseterllc.com to comment on this article or suggest articles that you’d like to see and visit his website www.kellyrburke.com to view prior columns. Next What Could Go Wrong If We Ban Guns?